The Greater Phoenix area averages 211 clear days and 85 partly cloudy days each year. That’s over 300 days of sunshine a year! 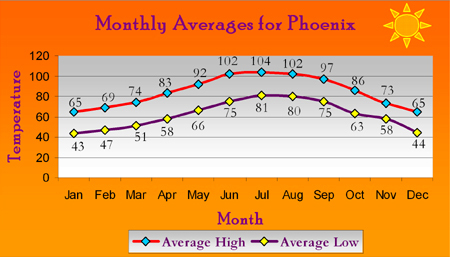 View the map below to see the monthly temperature highs and lows for Phoenix. Yes, there is such a thing as a monsoon season in Arizona. The season usually begins in early-to-mid July and as late as August in some years. The beginning of the monsoon season is triggered by three straight days with a 55 degree dew point or higher. Along with the monsoon season comes fierce thunderstorms and typically the heaviest rains of the year. These summer storms occur in late afternoon or early evening and cause flash floods and the most beautiful pastel sunsets after they dissipate. Typically dust storms occur from May through September when high winds brush across dry desert lands. This results in a usually brief, blinding wall of dust that can cause blinding conditions. Dust Storms are especially dangerous when motorist are traveling on major highways and interstates.